What happens when you’ve simply outgrown your space? When you’re just too popular and everyone wants to stop by but there’s just no more room? When you’ve expanded so much that you’re bursting at the seams, literally? Well kids, we stopped by The Pocket Espresso Bar to ask them, ‘cause they’ve just moved to an amazing, new home for this very reason. Oh, and yes they’re now even more incredible than ever in case you were wondering. 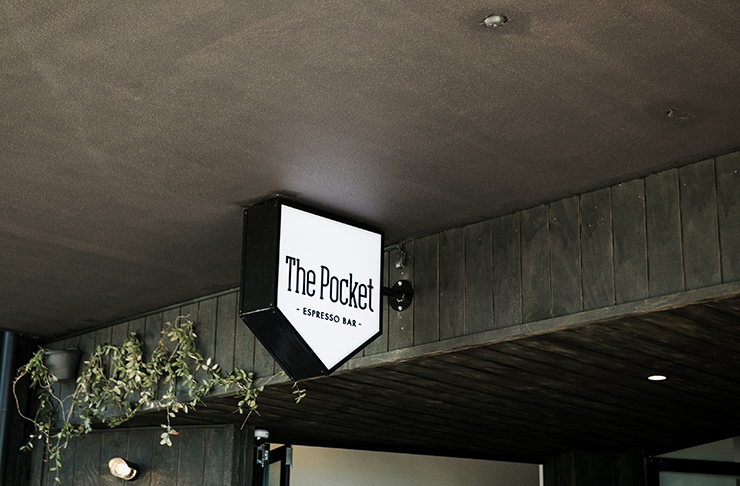 That’s right guys, our perennial fave here on the Coast, The Pocket Espresso Bar, has just moved and it’s not as complicated as you might think. They’ve literally moved right next door to their old residence. So, when we went hunting for the new digs, it really wasn’t that hard to find. (Hint: simply close your eyes and follow your nose. The smell of coffee will help guide you). The new and improved space is not only substantially bigger (and better) but it’s pretty stunning too. 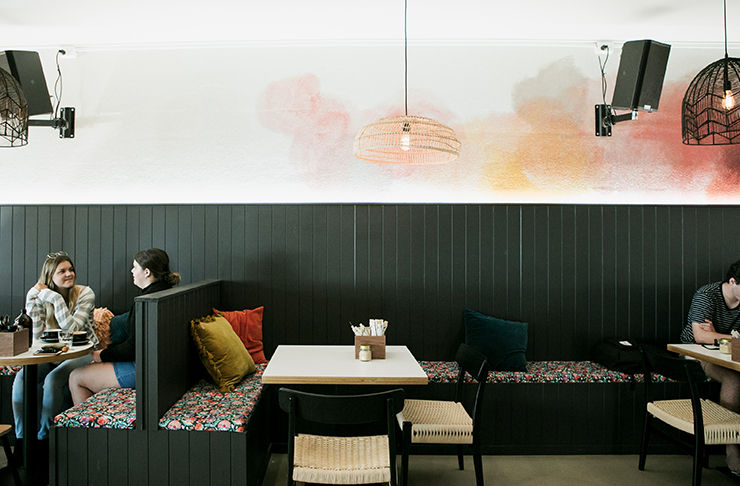 We just love it when fabulous food and great design come together to create a destination location. Think: pale pink walls skilfully mixed with eclectic artwork, moody dark bench seating, modern wicker light features, with highlights of warm timbers and accent tiles adding pops of colour. Several bi-fold windows let sunlight flood the cafe interiors and indoor plants delicately drape over the exterior of the shopfront, creating an inviting first greeting to all who stroll by. But we digress. Let’s chat about the food. We know you’re dying to hear all about it. 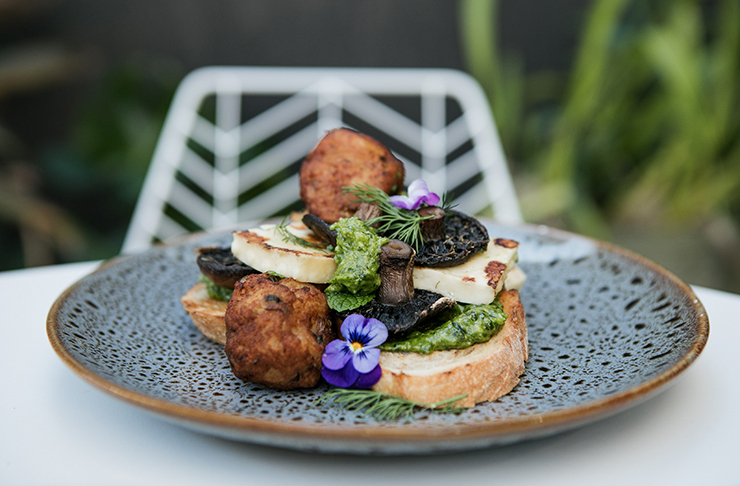 And we’re going to start with the ALWAYS popular corn fritters and roasted mushrooms. This is an absolute menu standout and are a must try, as are the veggie and smoothie bowls. The latter are both great options for gluten free diners too. But the most exciting news is these guys can not only now do dinner, but also adult beverages too. We’re also thrilled to tell you that Your Mates is on tap, in addition to some delicious cocktails. And let’s just be honest, who does love a cocktail during our warmer summer months. They’re just so damn refreshing. There’s both ample indoor and outdoor seating too. The private courtyard area is going to perfect for those hot summer days on the Coast when you want to grab some sun in the morning before the temp heats up too much. We can already picture ourselves with the crew on a hot summer evening enjoying a few refreshing mojitos while the sun sets. Agh, bring it on we say. We know moving is literally the worst, but we’re so glad they did. Now we can enjoy brekky, lunch, dinner and drinkies here all your round. And honestly, what could be better than that? We’re thinking, not much. Love Moffat Beach? Why don't you check out Your Mates and their amazing taproom right around the corner? It's a winner. We promise.